Knitted in a multiple of 4 stitches plus 1 additional stitch. 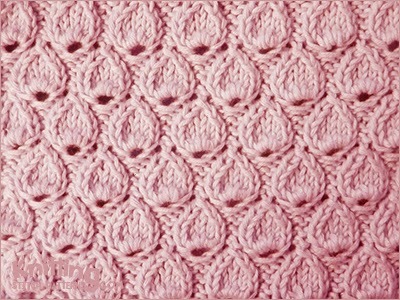 Row 1 - Right side: P1, * (k1, p1, k1, p1, k1) in next stitch, p3; repeat from * to end. Row 2: * K3, p5; repeat from * to last st, k1. Row 3: P1, * k5, p3; repeat from * to end. Row 4: * K3, p5; repeat from * to last st, k1. Row 5: P1, * ssk, k1, k2tog, p3; repeat from * to end. Row 6: * K3, p3; repeat from * to last st, k1. Row 7: P1, * sl 1-k2tog-psso, p1, (k1, p1, k1, p1, k1) in next stitch, p1; repeat from * to end. Row 8: K1, * p5, k3; repeat from * to end. Row 9: * P3, k5; repeat from * to last st, p1. Row 10: K1, * p5, k3; repeat from * to end. Row 11: * P3, ssk, k1, k2tog; repeat from * to last st, p1. Row 12: K1, * p3, k3 ; repeat from * to end. Row 13: P1, * (k1, p1, k1, p1, k1) in next stitch, p1, sl 1-k2tog-psso, p1; repeat from * to end. Repeat rows 2 - 13. 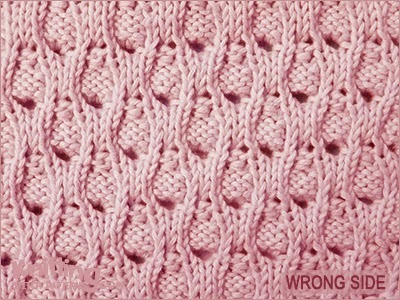 When binding off, do so on Row 7 or Row 13, omitting the increases. K: Knit | P: Purl | K2tog: Knit 2 sts together | Ssk: Slip slip knit. Sl 1-k2tog-psso: Slip stitch as if to knit, knit 2 stitches together, pass slipped stitch over.